Arriving on a chilly February morning at the Ensign depot, I walked into the yard to be met by the wonderful sight of RT624 and Cravens RT1431, gently ticking over waiting to depart for Central London. It was a proud moment for me, and the realisation that in just a couple of hours, these two fine buses would be full of enthusiasts, and at last, after so much planning and hard work, The Classic London Bus Society would finally be up and running. Boarding RT624 with my son Alex around 9am, we left Ensign driven by Peter Brown, for the journey into London. Our pick up point for members was outside Embankment tube station, and I was secretly hoping there might be a handful there to greet our arrival. However as we turned the corner at the bottom of Northumberland Avenue, there must have been 40 or more with cameras at the ready. What an uplifting moment it was! Having loaded RT624 up, the Cravens RT then arrived on cue, driven by Ross Newman, and that was duly filled as well. Now time for the off, and as I collected fares and issued high visibility vests on RT624, it was a good opportunity to meet members, and put faces to names. With the Limehouse Link Tunnel closed for the day, our journey to Ensign took almost an hour, but that gave me the opportunity to transfer from one bus to the other and repeat the process. I don't think I have ever been on a bus with such excited enthusiasts as these two carried, and as we got nearer to Purfleet, the levels seemed to grow. Disembarking at Ensign, members were split into three groups, and given the VIP tour treatment by Steve and Peter Newman, and Paul Dickson. 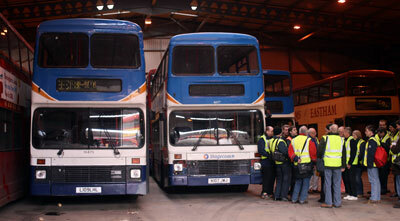 Their passion for buses came shining through, and everyone was greatly appreciative of their time. As ever, there were a huge number of interesting vehicles to see, from both the heritage fleet and the sales stock - each seemingly with its own story to be told. With something to meet all tastes, the constant sound of camera shutters echoed around the barns. All too soon it was time to jump back on board our RTs and we enjoyed a brief stop at The Royal Hotel in Purfleet, where Mike Welch, the major shareholder of RT624, gave a brief talk on its acquisition and restoration, as members enjoyed a buffet lunch. 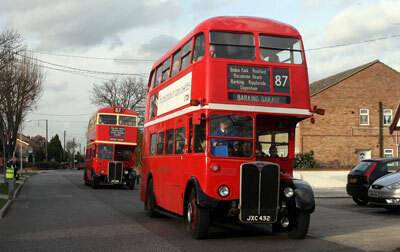 Then off again to join former route 87 in Rainham, the route of my childhood, and where my passion for buses began. Seeing these two splendid vehicles proudly displaying their 87 blinds (kindly provided by Mike Welch) bought back many happy memories from long ago. After a pause or two for photographs, it was off to Barking Garage along the 87 route, for a final stop, and a chance for RT624 to return for the first time since it's day of fame as the last service RT in April 1979. We finally arrived back at Embankment around 5pm, and with members clutching their TCLBS goody bags, it was time to bid everyone farewell. I'm grateful to everyone who came along, and especially to those who played their part to make it such a memorable day. As I journeyed back on what seemed a very quiet and empty bus to Purfleet, it gave me the opportunity to reflect on a day I shall always remember with great affection and pride. 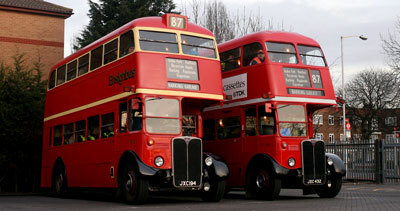 The photos of the day on this page are kindly provided by Terry Wong Min, and come from his website at http://londonbuspics.fotopic.net/. Further images can be seen on Jimmy Sheng's site http://jimmyshengukbuses2.fotopic.net/ and John Glover's at http://john678-buses.fotopic.net/c1452182.html.